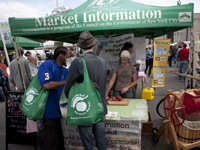 Thanks to the continued leadership of Governor Cuomo, New York State has created a plan to ensure that customers across the United States using Supplemental Nutrition Assistance Program (SNAP) at farmers markets can continue to do so, thus protecting the viability of farm businesses in New York and throughout the country. For the past month, the capacity to accept SNAP/EBT at many farmers markets was in jeopardy. Without Governor Cuomo’s support, the company that operated the app used by Greenmarket and 1700 other farmers markets across the country, Novo Dia Group, would have gone out of business on July 31st. Now, Novo Dia’s app, Mobile Market Plus, will remain in operation at least through February 2019. GrowNYC is dedicated to ensuring that all New Yorkers can choose to participate in a regional food system, support local farmers, and have access to healthy, local food. We thank Governor Cuomo for his continued leadership in championing upstate growers and connecting them to New York City farmers markets. "Governor Cuomo’s tenure has been marked by a steadfast dedication to safeguarding the viability of our state’s farms, whether through supporting the New York State Greenmarket Regional Food Hub or promoting and expanding the production of New York State craft beverages. This extension until February will allow enough time to find a permanent solution to processing SNAP at farmers markets; we are deeply grateful for Governor Cuomo’s help,” said Marcel Van Ooyen, CEO and President of GrowNYC. In 2017, GrowNYC processed $1.1 million in sales for farmers through SNAP/EBT cards, and we provide an additional $400k in Health Bucks to SNAP customers to spend on fresh fruits and vegetables, all of which goes directly into farmers’ pockets, helping to keep their farm businesses viable and bolstering rural economies in New York. Throughout the uncertainty of the past month, we’ve been heartened by the effluence of friendship and support from many, many organizations across the state and the country. The National Association of Farmers Market Nutrition Programs is providing funding to keep Novo Dia Group operating for an additional 30 days. While we are thankful for this immediate short term solution, there remains a need for a permanent fix to this issue. Please continue to contact your represenatives and ask for their support of SNAP acceptance in farmers markets. Recently, there have been stories in the press about farmers markets losing the ability to accept SNAP. GrowNYC was notified earlier this month that Novo Dia Group, the company that operates the app that Greenmarket uses to process SNAP at market, is going out of business as of July 31. This impacts farmers markets all over the country. GrowNYC’s priority is to continue to accept SNAP at every one of our locations without any break in service. We are dedicated to providing a marketplace accessible to all. Partners in New York State, New York City, and across the country are working to come up with short and long term solutions. Additional updates will be shared on this blog post as they develop. 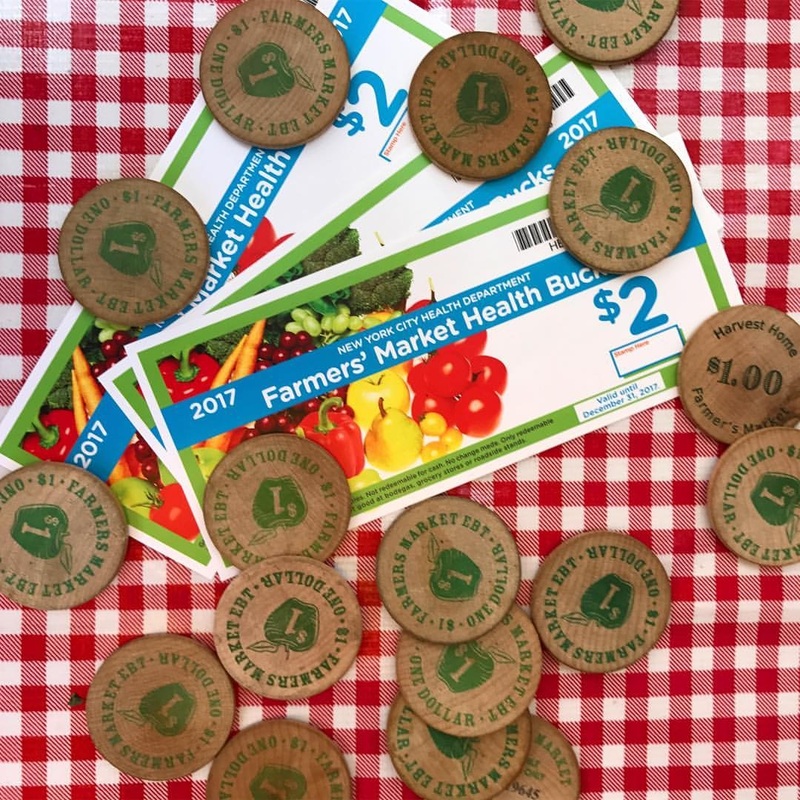 From now until November, while supplies last, for every $5 you spend with your EBT card at one of our Greenmarkets, you will receive a $2 Health Bucks coupon good for purchasing fresh fruits and vegetables in the market. The Health Bucks initiative was developed by the NYC Health Department District Public Health Offices and in 2013, GrowNYC’s Greenmarkets distributed over $260,000 worth of Health Bucks at 51 market locations. The increase of 40% in buying power can help increase a Food Stamp budget and encourage shoppers to spend more of their monthly Food Stamp allotment on fresh produce from the market. Overall, this innovative program helps GrowNYC/Greenmarket provide additional opportunities for shoppers to access fresh and affordable produce in NYC. Ever wondered if you might qualify for EBT/Foodstamp benefits? There are over 500,000 people in New York City that qualify for EBT/Foodstamps but do not receive them. Several of our markets will be holding EBT screening sessions throughout the summer to help New Yorkers find out if they qualify for Foodstamps and provide them with resources on how to file for those benefits. Partners including The New York City Coalition Against Hunger, The Food Bank of New York City, and The Met Council will be on hand at Union Square Greenmarket through the end of August on Mondays and Fridays from 9 am to 2 pm and at other markets throughout the summer and fall. Visit your local market webpage to find out if they will be hosting an upcoming screening. Learn more about GrowNYC's EBT and Food Access programs. Read more about Health Bucks are Back! Marcel Van Ooyen, Executive Director of GrowNYC, welcomes Senator Kirsten Gillibrand and fellow anti-hunger advocates to Union Square. On Monday, the Union Square Greenmarket hosted New York Senator Kirsten Gillibrand and Marcel Van Ooyen, executive director of GrowNYC, as well as anti-hunger advocates including chef Tom Coliccio and Joel Berg, executive director of New York City Coalition Against Hunger. The Senator announced the introduction of her proposed amendment to the 2012 Farm Bill, challenging the $4.5 billion in cuts to SNAP (Food Stamps) over the next ten years. "This Farm Bill is much more than a set of esoteric numbers. It’s very much about the decisions we are making regarding economic growth, regarding our agriculture industries, and the moral obligation we have to our families that are at risk," said Senator Gillibrand. "Food stamps are an extraordinary investment because for every dollar that you put into the SNAP program, you get out $1.71. Under the current bill, families in New York will lose about $90 a month in their food stamps, which means in the third week of the month, many families’ children will go to school hungry. It also means less food on a kitchen table for children. I have very grave concerns about what that says about us, and what we’re going to do about it." As Greenmarket shoppers know, Food Stamps are a critical component of GrowNYC's Greenmarket program. 90% of our markets accept EBT/Food Stamps, ensuring that all New Yorkers have access to healthy local food, and these dollars provide an important revenue source for Greenmarket farmers. Since 2007, Greenmarkets around the city have seen a steady increase in sales made at market with Electronic Benefit Transfer cards. "Over the course of the last five years, GrowNYC's EBT initiative has resulted in $1.53 million in revenue to farmers, generating an estimated $2.8 million of regional economic activity according to the USDA," said Marcel Van Ooyen, Executive Director of GrowNYC. "The exponential growth of EBT dollars spent at our Greenmarkets since 2007 demonstrates an ever increasing demand from all New Yorkers for fresh, healthy food. By providing access to the freshest food available, the food stamp at farmers market program plays a major role in curbing diet related disease, and ensures a healthier lifestyle for all citizens while simultaneously supporting regional agriculture. The proposed cut to the food stamp program would mean a devastating loss to farmers, as well as the families who need this assistance the most." Read the full press release from the event, and watch the video below of Senator Gillibrand as she introduced her amendment on the Senate floor yesterday. Greenmarket's EBT/Food stamps program continues to expand exponentially, with figures for the first half of 2011 coming in 3.5 times higher than in 2010. Thanks to continued support from Speaker Christine Quinn and the New York City Council, the number of Greenmarkets accepting EBT has risen steadily from 3 markets in 2005, to 23 markets in 2009, to the current 43 markets (including every Greenmarket in an outer borough) in 2011. Greenmarket attributes a large part of the EBT program’s success to the NYC Department of Health's Health Bucks program. July through November, $2 Health Bucks are given out for every $5 an EBT customer spends at qualifying Greenmarkets market--representing a 40% boost in buying power. Greenmarket's EBT program not only provides nutritious, local produce for all shoppers, it also makes a big impact on farmer revenues, providing 25-50% of farmer income in some cases. Click here for more information about Greenmarket's EBT Program. Today, Governor Andrew Cuomo released A Transformational Plan for a New New York, a 31-page plan designed to "fundamentally transform New York State’s government and economy." The plan included a section entitled Expand Fresh Food into Urban Centers: Urban Markets meets NY Produce, prominently featuring the Greenmarket program, our new Wholesale Greenmarket at the Hunts Point Terminal Produce Market, and our extensive EBT/SNAP/WIC program at Greenmarkets. Read the Transformational Plan for a New New York.